"I do not know the true meaning of painting any more than I know why we live or die." Ren� Magritte, along with Paul Delveaux, were Belgium's ambassadors to the Surrealist movement, still as popular today as in its prime, the first half of the 20th Century. While the flamboyant Spaniard, Salvador Dal�, has become the first name in Surrealism, it may be true that the most striking and familiar images originated from the quiet yet cunning palette of Magritte. While Dal�, Yves Tanguey and other Surrealists gave us images outside reality that were often bizarre and disturbing, the more "conservative" Magritte gave us recognizable incongruities, images that eventually reconcile in the mind and become comfortable, if extraordinary, visions. His iconography is irrational, but as decipherable to the viewer as a child's; even his most mysterious subjects are accessible to the general public. This phrase, scrawled beneath a drawing of an ordinary tobacco pipe, becomes a powerful message in its simplicity. Indeed, the drawing is NOT a pipe, but a representation of an object one might use to inhale burning tobacco. 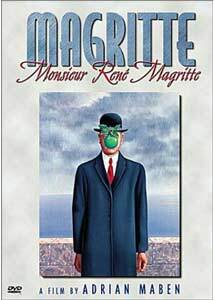 Magritte reminds us that art is symbolic of whatever it may depict, and is never the thing itself. With this basic premise, the artist subjects us to his conception of the world, raising questions about how we perceive everything, even details of our daily lives. This documentary attempts to dissect the recurrent symbols in Magritte's work and disentangle his personal history from his art, looking for more intimate definitions for his visual enigmas. Although this seems somewhat contraposed to the artist's intent, the director does not reach too far into private details and stops short of drawing conclusions. In the usual fashion, paintings are interspersed with photographs and some vintage footage of an interview with the artist, filmed later in his life; narration is enhanced by translated voiceover of Magritte's own words. There is a delightful clip included from Georges M�li�s' 1901 short, L'Homme � la t�te en caoutchouc (The Man with the Indian Rubber Head), a film Magritte enjoyed as a child. While there is nothing exceptional about this presentation, it did win an award from the Paris International Art Film Festival. Deceptively simplistic, the surreal work of Ren� Magritte, which finally came to international attention in the "art boon of the 1950s and 60s," will linger with the viewer long after this program ends. Image Transfer Review: While there are no digital anomalies, it appears that there was no enhancement of the source, either; the film is dirty, with specks, dust and scratches abounding. Colors seem natural, but dark overall and it is difficult to judge how close the images displayed come to the actual paintings. Still, none of this distracts much from enjoyment of the content, and in documentary films, imparting the information is primary. Audio Transfer Review: Image presents this film in Dolby Digital mono, which is sufficient. Narration is clear at all times and the often bizarre, mostly atmospheric soundtrack, which appropriately includes the work of B�la Bart�k, is pleasant enough. Extras Review: 12 chapter stops spread across three screens containing 4 thumbnail frames is a step out of the ordinary for this series; their design is rather unpleasant, I'm afraid. On the other hand, the cover design is rather better than usual and certainly more engaging than most art discs thus far in Image's collection. "I dread knowing precisely where my limits are." The ambiguous, poetic art of Ren� Magritte presented here can serve to inspire a new generation perhaps yet unfamiliar with his work. Spending an hour immersed in visions both fanciful and acute is time well spent; recommended for anyone who is in the mood to rethink how they perceive their surroundings.